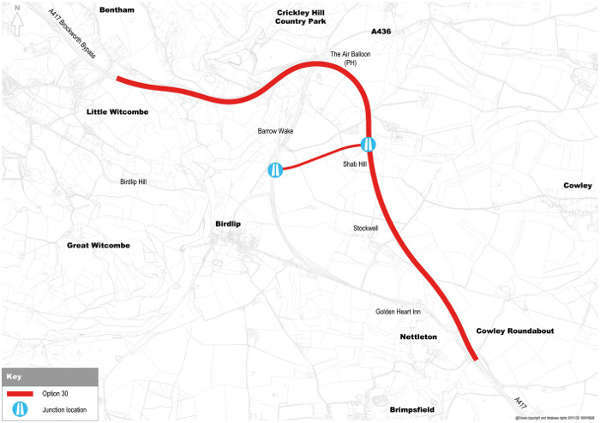 Highways England has announced its preferred route for the ‘Missing Link’ upgrade to the A417 in Gloucestershire, having shaved £50m off the cost. The Government-owned company said it has selected ‘Option 30’, one of two options it presented to the public a year ago. The improvements planned for the road near Gloucester will upgrade the last stretch of single carriageway of the road linking the M5 with the M4 - commonly known as the ‘Missing Link’ - to dual carriageway. Highways England said it will bring more predictable journey times and improved safety for drivers, while communities will experience less air pollution from queuing traffic. The works will depend on inclusion in the Government’s second Road Investment Strategy (RIS 2), which covers 2020-25. As Highways reported last year, Highways England had to seek specific permission from the Government to progress the scheme as it had been assessed as poor value for money at a price tag of £485m for Option 30. However, the company told Highways that it had received clearance in principle from both the Department for Transport and the Treasury. Highways England said the preferred route will now cost around £435m, representing an improved benefit to cost ratio (BCR) to reach 1.6. It added that a number of factors impacted the BCR, and that changes in design will deliver a scheme offering lower maintenance costs, improved safety, greater reliability and fewer impacts from roadworks along the route. 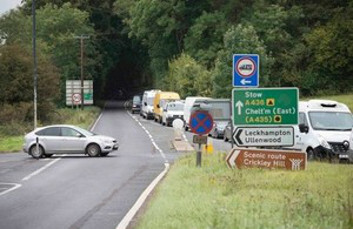 Gloucestershire County Council said it was ‘delighted’ that its preferred route had been chosen. Council leader Mark Hawthorne said: 'We have been pushing for decades to sort out the A417 missing link - and today’s news puts the project much closer to the finishing post. The chosen route will create a new 3.4-mile dual carriageway section of the road, complemented by an extra climbing lane at Crickley Hill for slow moving traffic. A new section of road built through Shab Hill to the East of the existing A417 will re-join the road near the current location of Cowley roundabout and a new junction will be created at Shab Hill with links to Birdlip and the A436. The Air Balloon Roundabout and Cowley Roundabout are to be removed as part of the scheme. Highways England said that working in an Area of Outstanding Natural Beauty ‘it has been important to work with key stakeholders’ and its chosen option will see work to restore and improve the landscape and create improved connections including a ‘green bridge’. It said walkers will also benefit as the scheme will improve access to public footpaths, including the Cotswold Way National Trail and the Gloucestershire Way. Highways England said it will now focus on more detailed design, which will be the subject of a new consultation later this year before it submits a Development Consent Order. Darren Shirley, chief executive of Campaign for Better Transport, told Highways: ‘This is a flawed decision that calls into question the basis on which the Government decides on its infrastructure spending. Something has gone deeply wrong within Government to allow this scheme to progress.